TO PLACE AN ORDER - To order tea, input # of ounces for QUANTITY for each loose tea choice or # of boxes for teabags. Minimum tea purchase is 2 ounces per tea. Tea prices are quoted per ounce. To order non-tea merchandise, input # of units for QUANTITY for each item. Minimum Total Purchase is $10.00, not including shipping charge. 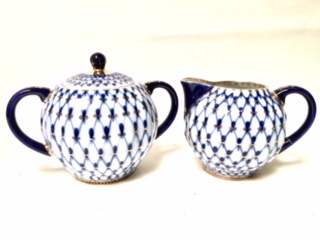 Cobalt Net creamer and sugar bowl set. Sold as 2 pcs. set.